The average charged hadron multiplicity in the e+e- events with the primary t t ¯ MathType@MTEF@5@5@+=feaafiart1ev1aaatCvAUfKttLearuWrP9MDH5MBPbIqV92AaeXatLxBI9gBaebbnrfifHhDYfgasaacH8bkY=wiFfYlOipiY=Hhbbf9v8qqaqFr0xc9vqpe0di9q8qqpG0dHiVcFbIOFHK8Feei0lXdar=Jb9qqFfeaYRXxe9vr0=vr0=LqpWqaaeaabiGaciaacaqabeaabeqacmaaaOqaaiabdsha0jqbdsha0zaaraaaaa@2DF1@ -pair at the collision energy 500 GeV, as well as the average multiplicity of charged hadrons from the top quark are calculated in QCD to be 86.7 ± 1.11 and 41.0 ± 0.54, respectively. Experiments at LEP and SLAC revealed, besides other important results, quite interesting feature of the hadron multiple production dependent on the mass of the "primary" (anti)quarks which launch the process of the QCD evolution. It appeared that differences between the light and heavy quark-induced multiplicities become energy-independent. QCD calculations describe the phenomenon quite well. Certainly, LEP could not give the information on the events induced by the top quarks. Recent discussions of the ILC project give us occasion to provide QCD predictions concerning the hadron multiple production in the events with primary t-quarks. n t = 41.03 ± 0.27. 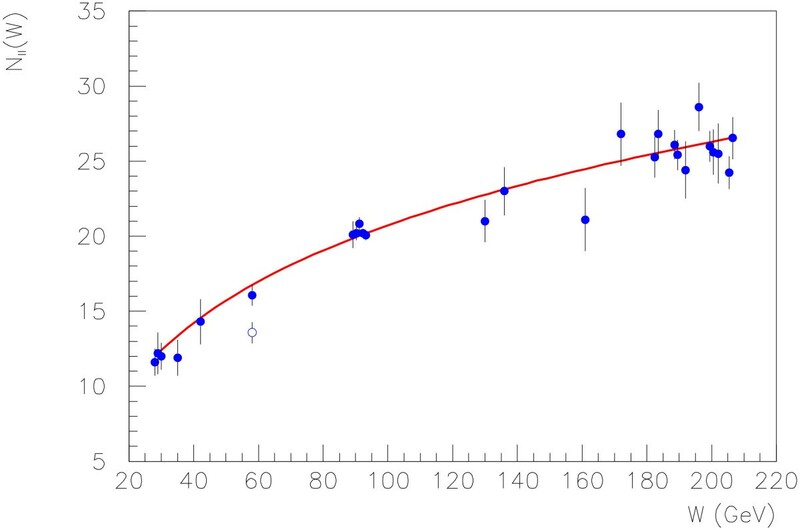 Both values correspond to the average value of the top mass m t = 170.9. Everywhere below, it is assumed that we deal with average multiplicities of charged hadrons. The paper is organized as follows. In order to make our calculations of the hadron multiplicity in top quark events more easy for understanding, we consider first the multiple hadron production in c c ¯ MathType@MTEF@5@5@+=feaafiart1ev1aaatCvAUfKttLearuWrP9MDH5MBPbIqV92AaeXatLxBI9gBaebbnrfifHhDYfgasaacH8bkY=wiFfYlOipiY=Hhbbf9v8qqaqFr0xc9vqpe0di9q8qqpG0dHiVcFbIOFHK8Feei0lXdar=Jb9qqFfeaYRXxe9vr0=vr0=LqpWqaaeaabiGaciaacaqabeaabeqacmaaaOqaaiabdogaJjqbdogaJzaaraaaaa@2DAD@ ( b b ¯ MathType@MTEF@5@5@+=feaafiart1ev1aaatCvAUfKttLearuWrP9MDH5MBPbIqV92AaeXatLxBI9gBaebbnrfifHhDYfgasaacH8bkY=wiFfYlOipiY=Hhbbf9v8qqaqFr0xc9vqpe0di9q8qqpG0dHiVcFbIOFHK8Feei0lXdar=Jb9qqFfeaYRXxe9vr0=vr0=LqpWqaaeaabiGaciaacaqabeaabeqacmaaaOqaaiabdkgaIjqbdkgaIzaaraaaaa@2DA9@ ) events. The hadron multiplicities in e+e- events associated with the t t ¯ MathType@MTEF@5@5@+=feaafiart1ev1aaatCvAUfKttLearuWrP9MDH5MBPbIqV92AaeXatLxBI9gBaebbnrfifHhDYfgasaacH8bkY=wiFfYlOipiY=Hhbbf9v8qqaqFr0xc9vqpe0di9q8qqpG0dHiVcFbIOFHK8Feei0lXdar=Jb9qqFfeaYRXxe9vr0=vr0=LqpWqaaeaabiGaciaacaqabeaabeqacmaaaOqaaiabdsha0jqbdsha0zaaraaaaa@2DF1@ -pair production are calculated in Section 3 in the framework of perturbative QCD. In Section 4 the numerical estimations and our main results are presented. 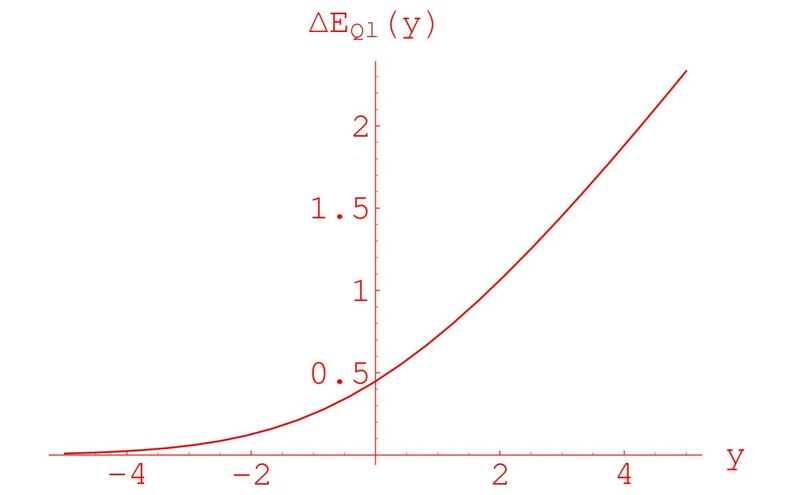 where q means a type of quarks produced in the process of e+e- annihilation into hadrons at the collision energy W. In what follows, the notation q = Q (heavy quark) will mean charm or beauty quark, while the notation q = l (light quark) will correspond to a massless case (when a pair of u, d or s-quarks is produced, whose masses are assumed to be equal to zero). The top quark production (q = t) will be studied in Sections 3 and 4. The first term in the r.h.s. of Eq. (3), 2n q , is the multiplicity of primary (anti)quark of the type q (i.e. 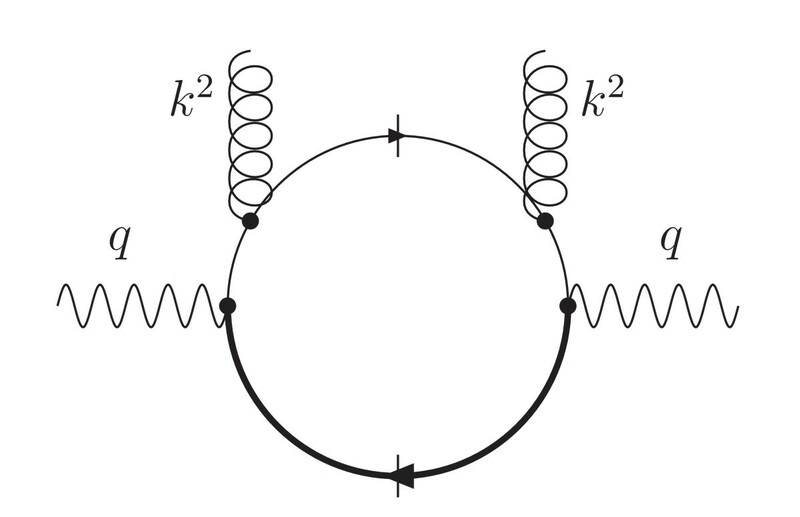 the multiplicity from the leading hadron which contains this (anti)quark). It is taken from an analysis of the data (2n c = 5.2, 2n b = 11.1 , and 2n l = 2.4 ). The quantity n g (k2) in (3) is the mean multiplicity of the gluon jet with a virtuality k2, for which we will take a QCD-based parametric form, with parameters fit to data, while E q (k2/W2) is the inclusive spectrum of the gluon jet emitted by primary quarks. It was explained in detail in Ref. that one should not consider this mechanism of hadron production via gluon jets as due to "a single cascading gluon". That quantity E(k2/W2) is an inclusive spectrum of the gluon jets is seen, e.g., from the fact that the average number of jets ∫dk2/k2 E q (k2/W2) ≠ 1. Q0 is a phenomenological parameter denoting the scale at which "precon-finement" of the off-shell partons occurs (as explained in Ref. ). In particular, N l l ¯ MathType@MTEF@5@5@+=feaafiart1ev1aaatCvAUfKttLearuWrP9MDH5MBPbIqV92AaeXatLxBI9gBaebbnrfifHhDYfgasaacH8bkY=wiFfYlOipiY=Hhbbf9v8qqaqFr0xc9vqpe0di9q8qqpG0dHiVcFbIOFHK8Feei0lXdar=Jb9qqFfeaYRXxe9vr0=vr0=LqpWqaaeaabiGaciaacaqabeaabeqacmaaaOqaaiabd6eaonaaBaaaleaacqWGSbaBcuWGSbaBgaqeaaqabaaaaa@2F22@ (Y) means the multiplicity of hadrons in light quark events, while N Q Q ¯ MathType@MTEF@5@5@+=feaafiart1ev1aaatCvAUfKttLearuWrP9MDH5MBPbIqV92AaeXatLxBI9gBaebbnrfifHhDYfgasaacH8bkY=wiFfYlOipiY=Hhbbf9v8qqaqFr0xc9vqpe0di9q8qqpG0dHiVcFbIOFHK8Feei0lXdar=Jb9qqFfeaYRXxe9vr0=vr0=LqpWqaaeaabiGaciaacaqabeaabeqacmaaaOqaaiabd6eaonaaBaaaleaacqWGrbqucuWGrbqugaqeaaqabaaaaa@2EB6@ (Y) denotes the multiplicity of hadrons in a process when a pair of the heavy quarks is produced. is the following. It describes the average number of hadrons produced in virtual gluon jets emitted by the primary quark and antiquark of the type q. In other words, it is the multiplicity in q q ¯ MathType@MTEF@5@5@+=feaafiart1ev1aaatCvAUfKttLearuWrP9MDH5MBPbIqV92AaeXatLxBI9gBaebbnrfifHhDYfgasaacH8bkY=wiFfYlOipiY=Hhbbf9v8qqaqFr0xc9vqpe0di9q8qqpG0dHiVcFbIOFHK8Feei0lXdar=Jb9qqFfeaYRXxe9vr0=vr0=LqpWqaaeaabiGaciaacaqabeaabeqacmaaaOqaaiabdghaXjqbdghaXzaaraaaaa@2DE5@ event except for multiplicity of the decay products of the primary quarks at the final stage of hadronization (the terms 2n q in (7)). are introduced. The lower limit of integration in Eq. (15), -ln(W2/ m Q 2 MathType@MTEF@5@5@+=feaafiart1ev1aaatCvAUfKttLearuWrP9MDH5MBPbIqV92AaeXatLxBI9gBaebbnrfifHhDYfgasaacH8bkY=wiFfYlOipiY=Hhbbf9v8qqaqFr0xc9vqpe0di9q8qqpG0dHiVcFbIOFHK8Feei0lXdar=Jb9qqFfeaYRXxe9vr0=vr0=LqpWqaaeaabiGaciaacaqabeaabeqacmaaaOqaaiabd2gaTnaaDaaaleaacqWGrbquaeaacqaIYaGmaaaaaa@2EA4@ ), is taken -∞ because of the fast convergence of the integral at negative y. 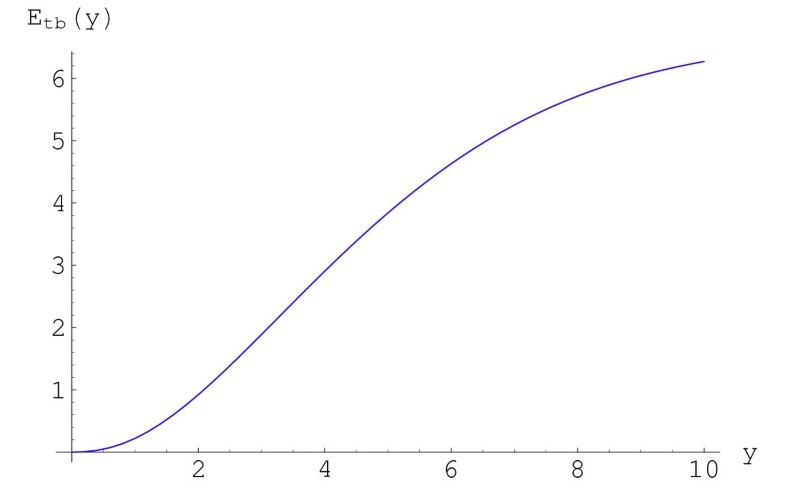 The function ΔE Q (y). with the multiplicity difference ΔN Q defined by Eq. (15). Our calculations  of the multiplicity differences δ Ql = N l l ¯ MathType@MTEF@5@5@+=feaafiart1ev1aaatCvAUfKttLearuWrP9MDH5MBPbIqV92AaeXatLxBI9gBaebbnrfifHhDYfgasaacH8bkY=wiFfYlOipiY=Hhbbf9v8qqaqFr0xc9vqpe0di9q8qqpG0dHiVcFbIOFHK8Feei0lXdar=Jb9qqFfeaYRXxe9vr0=vr0=LqpWqaaeaabiGaciaacaqabeaabeqacmaaaOqaaiabd6eaonaaBaaaleaacqWGSbaBcuWGSbaBgaqeaaqabaaaaa@2F22@ - N Q Q ¯ MathType@MTEF@5@5@+=feaafiart1ev1aaatCvAUfKttLearuWrP9MDH5MBPbIqV92AaeXatLxBI9gBaebbnrfifHhDYfgasaacH8bkY=wiFfYlOipiY=Hhbbf9v8qqaqFr0xc9vqpe0di9q8qqpG0dHiVcFbIOFHK8Feei0lXdar=Jb9qqFfeaYRXxe9vr0=vr0=LqpWqaaeaabiGaciaacaqabeaabeqacmaaaOqaaiabd6eaonaaBaaaleaacqWGrbqucuWGrbqugaqeaaqabaaaaa@2EB6@ (Q = b, c) with the use of formula (23) appeared to be in a good agreement with the data. Recently we have reconsidered the QCD upper limit on quantity δ bl  which appeared to be very close to all present experimental data on δ bl . The data on N ll as well as on δ bl at different energies corrected for detector effects as well as for initial state radiation were recently cited in . The goal of this paper is to calculate N t t ¯ h MathType@MTEF@5@5@+=feaafiart1ev1aaatCvAUfKttLearuWrP9MDH5MBPbIqV92AaeXatLxBI9gBaebbnrfifHhDYfgasaacH8bkY=wiFfYlOipiY=Hhbbf9v8qqaqFr0xc9vqpe0di9q8qqpG0dHiVcFbIOFHK8Feei0lXdar=Jb9qqFfeaYRXxe9vr0=vr0=LqpWqaaeaabiGaciaacaqabeaabeqacmaaaOqaaiabd6eaonaaDaaaleaacqWG0baDcuWG0baDgaqeaaqaaiabdIgaObaaaaa@309C@ , the average multiplicity of hadrons produced in e+e- events with the primary t t ¯ MathType@MTEF@5@5@+=feaafiart1ev1aaatCvAUfKttLearuWrP9MDH5MBPbIqV92AaeXatLxBI9gBaebbnrfifHhDYfgasaacH8bkY=wiFfYlOipiY=Hhbbf9v8qqaqFr0xc9vqpe0di9q8qqpG0dHiVcFbIOFHK8Feei0lXdar=Jb9qqFfeaYRXxe9vr0=vr0=LqpWqaaeaabiGaciaacaqabeaabeqacmaaaOqaaiabdsha0jqbdsha0zaaraaaaa@2DF1@ pair. We consider the case when the top (antitop) decay mode is pure hadronic. As a byproduct, we will calculate n t , the hadron multiplicity of the on-shell top decay products. where t ∗ ( t ¯ ∗ ) MathType@MTEF@5@5@+=feaafiart1ev1aaatCvAUfKttLearuWrP9MDH5MBPbIqV92AaeXatLxBI9gBaebbnrfifHhDYfgasaacH8bkY=wiFfYlOipiY=Hhbbf9v8qqaqFr0xc9vqpe0di9q8qqpG0dHiVcFbIOFHK8Feei0lXdar=Jb9qqFfeaYRXxe9vr0=vr0=LqpWqaaeaabiGaciaacaqabeaabeqacmaaaOqaaiabdsha0naaCaaaleqabaGaey4fIOcaaOGaeiikaGIafmiDaqNbaebadaahaaWcbeqaaiabgEHiQaaakiabcMcaPaaa@31EF@ denotes the virtual top quark (antiquark). The factorization of the matrix element (24) means that there is no significant space-time overlap in the decay products of the on-shell t and t ¯ MathType@MTEF@5@5@+=feaafiart1ev1aaatCvAUfKttLearuWrP9MDH5MBPbIqV92AaeXatLxBI9gBaebbnrfifHhDYfgasaacH8bkY=wiFfYlOipiY=Hhbbf9v8qqaqFr0xc9vqpe0di9q8qqpG0dHiVcFbIOFHK8Feei0lXdar=Jb9qqFfeaYRXxe9vr0=vr0=LqpWqaaeaabiGaciaacaqabeaabeqacmaaaOqaaiqbdsha0zaaraaaaa@2C80@ -quarks. Note that the off-shell t and t ¯ MathType@MTEF@5@5@+=feaafiart1ev1aaatCvAUfKttLearuWrP9MDH5MBPbIqV92AaeXatLxBI9gBaebbnrfifHhDYfgasaacH8bkY=wiFfYlOipiY=Hhbbf9v8qqaqFr0xc9vqpe0di9q8qqpG0dHiVcFbIOFHK8Feei0lXdar=Jb9qqFfeaYRXxe9vr0=vr0=LqpWqaaeaabiGaciaacaqabeaabeqacmaaaOqaaiqbdsha0zaaraaaaa@2C80@ -quarks fragment into hadrons through the emission of the gluon jets in a coherent way (the first term in the r.h.s of Eq. (24)). The QCD non-singlet evolution of the primary virtual t-quark is very slow because the difference of virtualities in logarithmic scale is very small down to the top quark mass. In other words, the virtual t-quark becomes "real" after just a few gluon radiations. The effect of possible color reconnection was investigated by comparing hadronic multiplicities in e+e- → W+W- → q q ¯ ′ q q ¯ ′ MathType@MTEF@5@5@+=feaafiart1ev1aaatCvAUfKttLearuWrP9MDH5MBPbIqV92AaeXatLxBI9gBaebbnrfifHhDYfgasaacH8bkY=wiFfYlOipiY=Hhbbf9v8qqaqFr0xc9vqpe0di9q8qqpG0dHiVcFbIOFHK8Feei0lXdar=Jb9qqFfeaYRXxe9vr0=vr0=LqpWqaaeaabiGaciaacaqabeaabeqacmaaaOqaaiabdghaXjqbdghaXzaaryaafaGaemyCaeNafmyCaeNbaeHbauaaaaa@30E9@ and e+e-→ W+W- → q q ¯ ′ l ν ¯ l MathType@MTEF@5@5@+=feaafiart1ev1aaatCvAUfKttLearuWrP9MDH5MBPbIqV92AaeXatLxBI9gBaebbnrfifHhDYfgasaacH8bkY=wiFfYlOipiY=Hhbbf9v8qqaqFr0xc9vqpe0di9q8qqpG0dHiVcFbIOFHK8Feei0lXdar=Jb9qqFfeaYRXxe9vr0=vr0=LqpWqaaeaabiGaciaacaqabeaabeqacmaaaOqaaiabdghaXjqbdghaXzaaryaafaGaemiBaWMafqyVd4MbaebadaWgaaWcbaGaemiBaWgabeaaaaa@32AE@ events. No evidence for final state interactions was found by measuring the difference 〈 n 4 q h 〉 − 2 〈 n 2 q l ν ¯ h 〉 MathType@MTEF@5@5@+=feaafiart1ev1aaatCvAUfKttLearuWrP9MDH5MBPbIqV92AaeXatLxBI9gBaebbnrfifHhDYfgasaacH8bkY=wiFfYlOipiY=Hhbbf9v8qqaqFr0xc9vqpe0di9q8qqpG0dHiVcFbIOFHK8Feei0lXdar=Jb9qqFfeaYRXxe9vr0=vr0=LqpWqaaeaabiGaciaacaqabeaabeqacmaaaOqaaiabgMYiHlabd6gaUnaaDaaaleaacqaI0aancqWGXbqCaeaacqWGObaAaaGccqGHQms8cqGHsislcqaIYaGmcqGHPms4cqWGUbGBdaqhaaWcbaGaeGOmaiJaemyCaeNaemiBaWMafqyVd4MbaebaaeaacqWGObaAaaGccqGHQms8aaa@41B5@ [8, 9]. From the space-time point of view W bosons and t-quarks behave in a similar way, ie. the latter manage to cover the distance Δ l ~ 1/Γ t , where Γ t is the full width of the top. Since Γ t ≃ Γ w , we expect no interference effects in the decays of the on-shell t and t ¯ MathType@MTEF@5@5@+=feaafiart1ev1aaatCvAUfKttLearuWrP9MDH5MBPbIqV92AaeXatLxBI9gBaebbnrfifHhDYfgasaacH8bkY=wiFfYlOipiY=Hhbbf9v8qqaqFr0xc9vqpe0di9q8qqpG0dHiVcFbIOFHK8Feei0lXdar=Jb9qqFfeaYRXxe9vr0=vr0=LqpWqaaeaabiGaciaacaqabeaabeqacmaaaOqaaiqbdsha0zaaraaaaa@2C80@ -quarks. This formula has been derived by calculating QCD diagrams in the first order in the strong coupling constant (see our comments after Eq. (3)). In the massless case (m = 0), we immediately come to the function E(k2/q2) (10), while by neglecting small corrections O(m2/q2), one can derive (after variables are properly changed) the explicit form of the function ΔE Q (k2/m2) = E Q (q2, k2, m2) - E(q2, k2) (19). In our case (q2 = W2, m = m t ) we will estimate the integrals in Eqs. (26), (27) numerically (for details, see Section 4). Now let us calculate another quantity in Eq. (25), n t , which describes the hadronic multiplicity of the t-quark decay products. The top weakly decays into W+ boson and b-quark. In its turn, the W+ boson decays into a quark-antiquark pair. Remember that we are interested in hadronic decays of the W boson. The quark-antiquark system results in massive jets which fragment into hadrons (see Fig. 3). 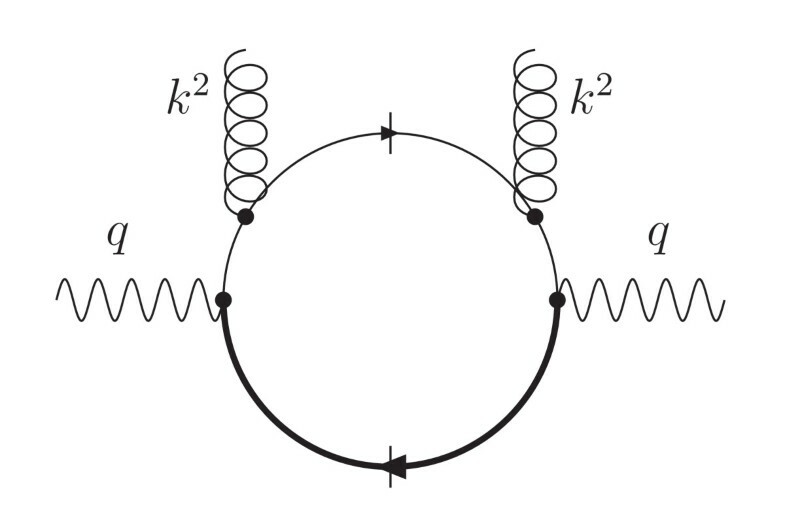 The emission of the gluon jets (spiral lines) by the quark pair resulting from the decay of the W+-boson in the first order in the strong coupling constant. The W+ boson is produced in the weak decay of the top. 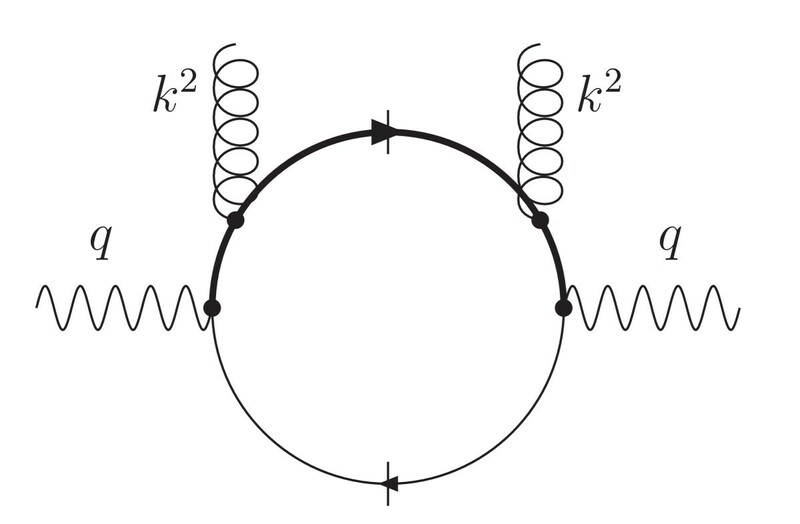 The gluon jets can be also emitted by the on-shell t-quark before its weak decay (the first diagram in Fig. 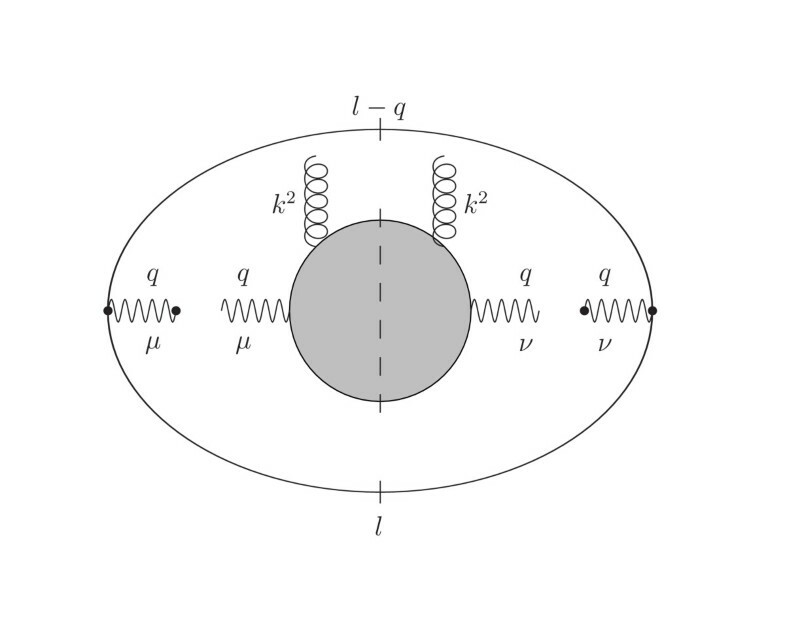 4) or by off-shell bottom quark (the second diagram in Fig. 4). At the end of these emissions, the on-shell b-quark weakly decays into hadrons whose average multiplicity is equal to n b . Since W-boson is a colorless particle, the diagrams in Fig. 4 do not interfere with those presented in Fig. 3. The emission of the gluon jets by the on-shell top quark and by off-shell bottom quark in the first order in the strong coupling constant. The emissions take place before and after the weak decay of the top, respectively. Off-shell quarks are denoted as t* and b*. n t = n W + n tb + n b . The quantity n b is experimentally measurable one . The first term in Eq. (29), n W , is the hadron multiplicity of the W boson decay products. The second term, n tb , is the hadron multiplicity in the gluon jets emitted by the on-shell top quark before its weak decay as well as by the bottom quark after the top decay. The W+ boson can decay either into two light quarks ( u d ¯ MathType@MTEF@5@5@+=feaafiart1ev1aaatCvAUfKttLearuWrP9MDH5MBPbIqV92AaeXatLxBI9gBaebbnrfifHhDYfgasaacH8bkY=wiFfYlOipiY=Hhbbf9v8qqaqFr0xc9vqpe0di9q8qqpG0dHiVcFbIOFHK8Feei0lXdar=Jb9qqFfeaYRXxe9vr0=vr0=LqpWqaaeaabiGaciaacaqabeaabeqacmaaaOqaaiabdwha1jqbdsgaKzaaraaaaa@2DD3@ and u s ¯ MathType@MTEF@5@5@+=feaafiart1ev1aaatCvAUfKttLearuWrP9MDH5MBPbIqV92AaeXatLxBI9gBaebbnrfifHhDYfgasaacH8bkY=wiFfYlOipiY=Hhbbf9v8qqaqFr0xc9vqpe0di9q8qqpG0dHiVcFbIOFHK8Feei0lXdar=Jb9qqFfeaYRXxe9vr0=vr0=LqpWqaaeaabiGaciaacaqabeaabeqacmaaaOqaaiabdwha1jqbdohaZzaaraaaaa@2DF1@ pairs) or into c d ¯ MathType@MTEF@5@5@+=feaafiart1ev1aaatCvAUfKttLearuWrP9MDH5MBPbIqV92AaeXatLxBI9gBaebbnrfifHhDYfgasaacH8bkY=wiFfYlOipiY=Hhbbf9v8qqaqFr0xc9vqpe0di9q8qqpG0dHiVcFbIOFHK8Feei0lXdar=Jb9qqFfeaYRXxe9vr0=vr0=LqpWqaaeaabiGaciaacaqabeaabeqacmaaaOqaaiabdogaJjqbdsgaKzaaraaaaa@2DAF@ ( c s ¯ MathType@MTEF@5@5@+=feaafiart1ev1aaatCvAUfKttLearuWrP9MDH5MBPbIqV92AaeXatLxBI9gBaebbnrfifHhDYfgasaacH8bkY=wiFfYlOipiY=Hhbbf9v8qqaqFr0xc9vqpe0di9q8qqpG0dHiVcFbIOFHK8Feei0lXdar=Jb9qqFfeaYRXxe9vr0=vr0=LqpWqaaeaabiGaciaacaqabeaabeqacmaaaOqaaiabdogaJjqbdohaZzaaraaaaa@2DCD@ ) pair. The former case is treated analogously to the light quark event in e+e- annihilation taken at the collision energy W = m W . Here we will study the latter case. The function N l l ¯ MathType@MTEF@5@5@+=feaafiart1ev1aaatCvAUfKttLearuWrP9MDH5MBPbIqV92AaeXatLxBI9gBaebbnrfifHhDYfgasaacH8bkY=wiFfYlOipiY=Hhbbf9v8qqaqFr0xc9vqpe0di9q8qqpG0dHiVcFbIOFHK8Feei0lXdar=Jb9qqFfeaYRXxe9vr0=vr0=LqpWqaaeaabiGaciaacaqabeaabeqacmaaaOqaaiabd6eaonaaBaaaleaacqWGSbaBcuWGSbaBgaqeaaqabaaaaa@2F22@ (Y) in (32) is the hadronic multiplicity in light quark events. Thus, we need to find an expression for ΔN cl . Note that the formulae (15), (19) from Section 2 correspond to the case when a pair of heavy or pair of light quarks is produced. Now we have to study the case when hadrons are produced in association with a single heavy quark (namely, c-quark) and one light quark. Here ρ = exp(-y). The quantity J(ρ) was defined above (20). The function ΔE Ql (y) is shown in Fig. 5. 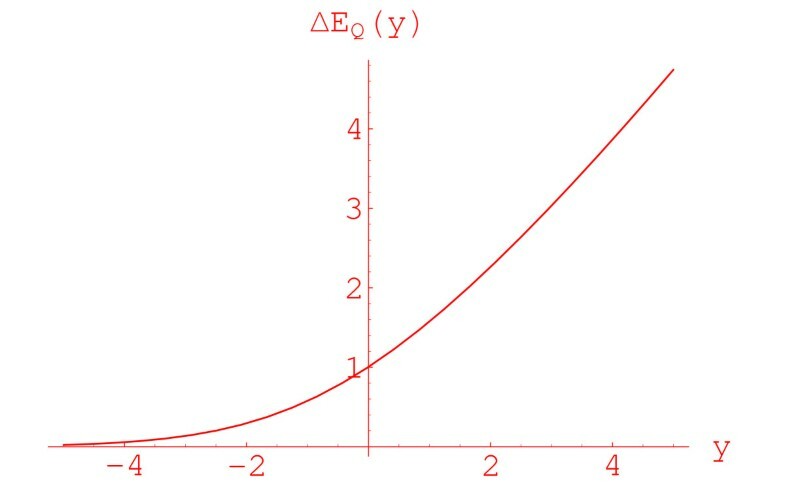 The function ΔE Ql (y). The function ΔE Q (y) (solid line) vs. function 2ΔE Ql (y) (dashed line). As was already said above, the on-shell top quark can emit jets before it weakly decays into W+b. After the weak decay of the top, the off-shell b-quark "throws off" its virtuality by emitting massive gluon jets. The fragmentation of these massive gluon jets into hadrons results in the average hadron multiplicity n tb . with k2 being the gluon jet invariant mass, (m t - m W - m b )2 its upper bound. 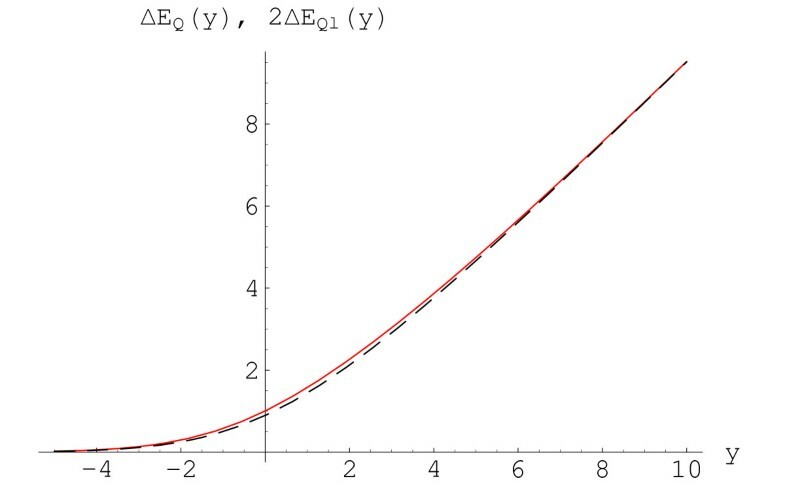 In the lowest order in the strong coupling constant, the quantity E tb (y) is given by two diagrams in Fig. 4. It is presented by an integral which depends on the ratio k 2 / m t 2 MathType@MTEF@5@5@+=feaafiart1ev1aaatCvAUfKttLearuWrP9MDH5MBPbIqV92AaeXatLxBI9gBaebbnrfifHhDYfgasaacH8bkY=wiFfYlOipiY=Hhbbf9v8qqaqFr0xc9vqpe0di9q8qqpG0dHiVcFbIOFHK8Feei0lXdar=Jb9qqFfeaYRXxe9vr0=vr0=LqpWqaaeaabiGaciaacaqabeaabeqacmaaaOqaaiabdUgaRnaaCaaaleqabaGaeGOmaidaaOGaei4la8IaemyBa02aa0baaSqaaiabdsha0bqaaiabikdaYaaaaaa@3258@ , as well as on mass ratios m W 2 / m t 2 MathType@MTEF@5@5@+=feaafiart1ev1aaatCvAUfKttLearuWrP9MDH5MBPbIqV92AaeXatLxBI9gBaebbnrfifHhDYfgasaacH8bkY=wiFfYlOipiY=Hhbbf9v8qqaqFr0xc9vqpe0di9q8qqpG0dHiVcFbIOFHK8Feei0lXdar=Jb9qqFfeaYRXxe9vr0=vr0=LqpWqaaeaabiGaciaacaqabeaabeqacmaaaOqaaiabd2gaTnaaDaaaleaacqWGxbWvaeaacqaIYaGmaaGccqGGVaWlcqWGTbqBdaqhaaWcbaGaemiDaqhabaGaeGOmaidaaaaa@3393@ and m b 2 / m t 2 MathType@MTEF@5@5@+=feaafiart1ev1aaatCvAUfKttLearuWrP9MDH5MBPbIqV92AaeXatLxBI9gBaebbnrfifHhDYfgasaacH8bkY=wiFfYlOipiY=Hhbbf9v8qqaqFr0xc9vqpe0di9q8qqpG0dHiVcFbIOFHK8Feei0lXdar=Jb9qqFfeaYRXxe9vr0=vr0=LqpWqaaeaabiGaciaacaqabeaabeqacmaaaOqaaiabd2gaTnaaDaaaleaacqWGIbGyaeaacqaIYaGmaaGccqGGVaWlcqWGTbqBdaqhaaWcbaGaemiDaqhabaGaeGOmaidaaaaa@33A9@ . This integral cannot be calculated analytically, but can be estimated numerically. The function E tb (y) is presented in Fig. 7. It is worth to note that in the Feynman gauge the dominating contribution to E tb (y) comes from the interference of two diagrams shown in Fig. 4. The function E tb (y). a = 3.89, b = 0.01, Q0 = 0.87 GeV. The result of our fit is presented in Fig. 8 in comparison with the data. Note that χ2/d.o.f. becomes twice smaller if the experimental point at W = 58 GeV (open circle in Fig. 8), which lies much lower than neighboring points, is crossed out from the fit. In such a case, the values of the parameters are practically the same as in (51) with χ2/d.o.f. = 0.90. The fit of the data on the hadron multiplicity in light quark events (solid line, see formula in the text). The data are taken from Ref. .
m t = 170.9 ± 1.8 GeV. m b = 4.85 ± 0.15 GeV. n tb = 16.14 ± 0.24. The error in Eq. (54) is defined by that of the multiplicity difference δ cl (49), while that in Eq. (55) comes from uncertainties of the quark masses m t (52) and m b (53). n W = 19.44 ± 0.13 ± 0.12. N t (W = 500 GeV) = 4.61 ± 0.11. The errors in (58) come from top quark mass errors. It follows From Eqs. (61), (58) that N t t ¯ ( e + e − → t t ¯ → hadrons ) MathType@MTEF@5@5@+=feaafiart1ev1aaatCvAUfKttLearuWrP9MDH5MBPbIqV92AaeXatLxBI9gBaebbnrfifHhDYfgasaacH8bkY=wiFfYlOipiY=Hhbbf9v8qqaqFr0xc9vqpe0di9q8qqpG0dHiVcFbIOFHK8Feei0lXdar=Jb9qqFfeaYRXxe9vr0=vr0=LqpWqaaeaabiGaciaacaqabeaabeqacmaaaOqaaiabd6eaonaaBaaaleaacqWG0baDcuWG0baDgaqeaaqabaGccqGGOaakcqWGLbqzdaahaaWcbeqaaiabgUcaRaaakiabdwgaLnaaCaaaleqabaGaeyOeI0caaOGaeyOKH4QaemiDaqNafmiDaqNbaebacqGHsgIRcqqGObaAcqqGHbqycqqGKbazcqqGYbGCcqqGVbWBcqqGUbGBcqqGZbWCcqGGPaqkaaa@4644@ = 86.67 ± 0.55. It appeared that the data on the average multiplicity in light quark events can be fitted well by using this expression (with A = 4.21, B = 0.012 and Q0 = 0.93 GeV). In particular, we have obtained the following average values for the hadronic multiplicities: n W = 19.52, n tb = 16.43, N t = 4.59. Thus, theoretical uncertainties can be estimated to be 0.47 and 0.96 for n t and N t t ¯ MathType@MTEF@5@5@+=feaafiart1ev1aaatCvAUfKttLearuWrP9MDH5MBPbIqV92AaeXatLxBI9gBaebbnrfifHhDYfgasaacH8bkY=wiFfYlOipiY=Hhbbf9v8qqaqFr0xc9vqpe0di9q8qqpG0dHiVcFbIOFHK8Feei0lXdar=Jb9qqFfeaYRXxe9vr0=vr0=LqpWqaaeaabiGaciaacaqabeaabeqacmaaaOqaaiabd6eaonaaBaaaleaacqWG0baDcuWG0baDgaqeaaqabaaaaa@2F42@ , respectively. n t (t → hadrons) = 41.03 ± 0.54. All estimations (63)–(65) correspond to the collision energy W = 500 GeV. We can mention the estimation of the hadron multiplicity from Ref. , N t t ¯ ( e + e − → t t ¯ → b b ¯ W + W − + hadrons ) ≈ 29 MathType@MTEF@5@5@+=feaafiart1ev1aaatCvAUfKttLearuWrP9MDH5MBPbIqV92AaeXatLxBI9gBaebbnrfifHhDYfgasaacH8bkY=wiFfYlOipiY=Hhbbf9v8qqaqFr0xc9vqpe0di9q8qqpG0dHiVcFbIOFHK8Feei0lXdar=Jb9qqFfeaYRXxe9vr0=vr0=LqpWqaaeaabiGaciaacaqabeaabeqacmaaaOqaaiabd6eaonaaBaaaleaacqWG0baDcuWG0baDgaqeaaqabaGccqGGOaakcqWGLbqzdaahaaWcbeqaaiabgUcaRaaakiabdwgaLnaaCaaaleqabaGaeyOeI0caaOGaeyOKH4QaemiDaqNafmiDaqNbaebacqGHsgIRcqWGIbGycuWGIbGygaqeaiabdEfaxnaaCaaaleqabaGaey4kaScaaOGaem4vaC1aaWbaaSqabeaacqGHsislaaGccqGHRaWkcqqGObaAcqqGHbqycqqGKbazcqqGYbGCcqqGVbWBcqqGUbGBcqqGZbWCcqGGPaqkcqGHijYUcqaIYaGmcqaI5aqoaaa@5226@ , which was obtained for W = 390 GeV and m t = 175 GeV. For the same values of W and m t , our formulae give N t t ¯ ( e + e − → t t ¯ → b b ¯ W + W − + hadrons ) = 34.3 MathType@MTEF@5@5@+=feaafiart1ev1aaatCvAUfKttLearuWrP9MDH5MBPbIqV92AaeXatLxBI9gBaebbnrfifHhDYfgasaacH8bkY=wiFfYlOipiY=Hhbbf9v8qqaqFr0xc9vqpe0di9q8qqpG0dHiVcFbIOFHK8Feei0lXdar=Jb9qqFfeaYRXxe9vr0=vr0=LqpWqaaeaabiGaciaacaqabeaabeqacmaaaOqaaiabd6eaonaaBaaaleaacqWG0baDcuWG0baDgaqeaaqabaGccqGGOaakcqWGLbqzdaahaaWcbeqaaiabgUcaRaaakiabdwgaLnaaCaaaleqabaGaeyOeI0caaOGaeyOKH4QaemiDaqNafmiDaqNbaebacqGHsgIRcqWGIbGycuWGIbGygaqeaiabdEfaxnaaCaaaleqabaGaey4kaScaaOGaem4vaC1aaWbaaSqabeaacqGHsislaaGccqGHRaWkcqqGObaAcqqGHbqycqqGKbazcqqGYbGCcqqGVbWBcqqGUbGBcqqGZbWCcqGGPaqkcqGH9aqpcqaIZaWmcqaI0aancqGGUaGlcqaIZaWmaaa@534B@ . The formulae (61)–(65) is our main result. We hope that the hadron multiplicities of the top decay products (Eqs. (61) and (62)) will be measured at the LHC. Here we present some formulae for the case when the W boson decays into hadrons via production of c s ¯ MathType@MTEF@5@5@+=feaafiart1ev1aaatCvAUfKttLearuWrP9MDH5MBPbIqV92AaeXatLxBI9gBaebbnrfifHhDYfgasaacH8bkY=wiFfYlOipiY=Hhbbf9v8qqaqFr0xc9vqpe0di9q8qqpG0dHiVcFbIOFHK8Feei0lXdar=Jb9qqFfeaYRXxe9vr0=vr0=LqpWqaaeaabiGaciaacaqabeaabeqacmaaaOqaaiabdogaJjqbdohaZzaaraaaaa@2DCD@ (or c d ¯ MathType@MTEF@5@5@+=feaafiart1ev1aaatCvAUfKttLearuWrP9MDH5MBPbIqV92AaeXatLxBI9gBaebbnrfifHhDYfgasaacH8bkY=wiFfYlOipiY=Hhbbf9v8qqaqFr0xc9vqpe0di9q8qqpG0dHiVcFbIOFHK8Feei0lXdar=Jb9qqFfeaYRXxe9vr0=vr0=LqpWqaaeaabiGaciaacaqabeaabeqacmaaaOqaaiabdogaJjqbdsgaKzaaraaaaa@2DAF@ ) pair. Since the total width of the W boson, Γ W , is much less than its mass, and the hadron multiplicity is a smooth function of energy, we will use zero width approximation and take the multiplicity at W = m W . It can be shown that the account of the W boson width results in corrections which are numerically small (less than 1.6%, see Appendix B). To calculate the inclusive spectrum of the gluon jets emitted by the decay products of the W-boson, we need to calculate two sub-diagrams of the diagram presented in Fig. 9. The generalized diagram describing the inclusive spectrum of the gluon jets (curly line) with the virtuality k2 inside the W boson (wavy line). 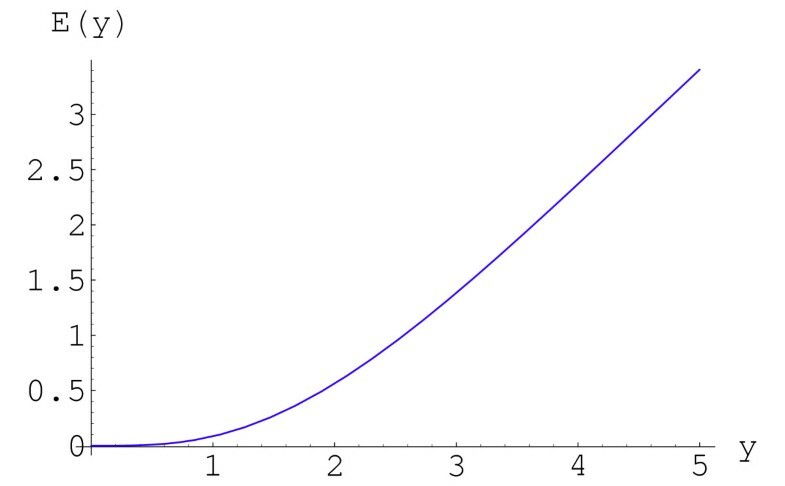 In its turn, the W boson is a product of the weak decay of the top quark (solid line with 4-momentum l). where m t and m b are masses of the top and beauty quark, respectively. In what follows, we will neglect power corrections of the type O(m c /m t ) and O(m b /m t ). The inner part of the diagram in Fig. 9 describes the distribution of the massive gluon jet with the invariant mass k2 produced by the W boson. Let D μν be the expression corresponding to this diagram. In the first order in the strong coupling constant, D μν is represented by the sum of three QCD diagrams presented in Figs. 10, 11 and 12. The inclusive distribution of the massive gluon jet with the virtuality k2. 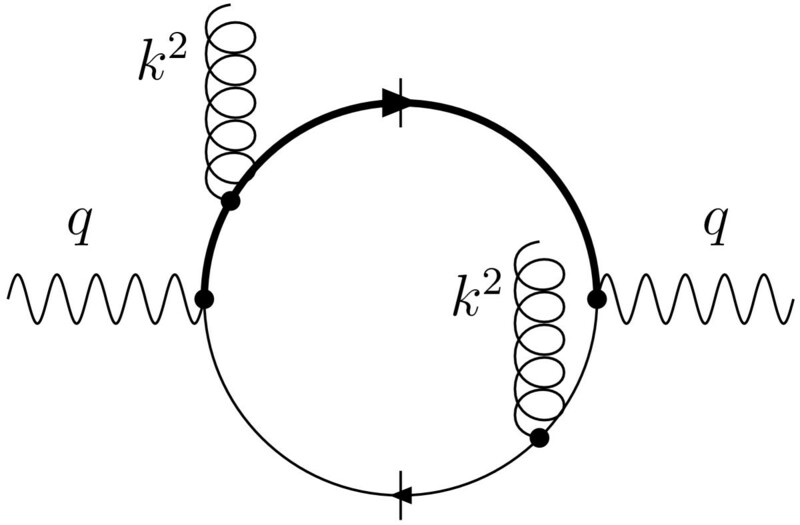 The wavy line is the W boson, whose 4-momentum is q. The thick quark line is a heavy quark, while the thin line is a light quark. The cut quark lines mean that these quarks are on-shell quarks. The same as in Fig. 10, but with the gluon jet emitted by the light quark. The interference diagram which also contributes to the inclusive distribution of the gluon jets with the virtuality k2 inside the W boson. The diagram is taken in the sum of the diagrams with the factor 2. Note that the parts of tensors Π μν and D μν antisymmetric in indices (as the last term in Eq. (A.1)) give no contribution after integration in lk. The analytic expressions for the functions D1(k2, qk), D2(k2, qk) in (A.2) are rather complicated to be shown here. That is why we present only the final results of our QCD calculations based on the formulae of this Appendix (see Eqs. (34), (35) in the main text). In this Appendix we will demonstrate that the account of the W boson width results in only small corrections to the hadronic multiplicities. In both <n h > (B.2) and N (B.3) the factor m W Γ W is introduced, while common constants are omitted. we do obtain that the mean multiplicity is equal to n h ( m W 2 MathType@MTEF@5@5@+=feaafiart1ev1aaatCvAUfKttLearuWrP9MDH5MBPbIqV92AaeXatLxBI9gBaebbnrfifHhDYfgasaacH8bkY=wiFfYlOipiY=Hhbbf9v8qqaqFr0xc9vqpe0di9q8qqpG0dHiVcFbIOFHK8Feei0lXdar=Jb9qqFfeaYRXxe9vr0=vr0=LqpWqaaeaabiGaciaacaqabeaabeqacmaaaOqaaiabd2gaTnaaDaaaleaacqWGxbWvaeaacqaIYaGmaaaaaa@2EB0@ ). <n tb > = 16.37. Thus, the account of non-zero width of the W boson slightly changes the average value of the multiplicities. Namely, n W (54) has gone down by 0.3, while n tb (55) has gone up by 0.23, but their sum remains almost unchanged. We are thankful to the referee for his comments and critical remarks that helped us to improve the presentation of some our results.